Alexa, what's the fastest way home? Alexa may soon be your secret weapon in beating rush-hour traffic, thanks to a new partnership announced today at CES 2019. Navigation experts HERE Technologies have announced they are now working with the car-specific tools within Amazon's smart assistant to help improve in-car navigation through voice interactions. The company has integrated Alexa Auto into its HERE Navigation On-Demand service, which is available to carmakers across the world, to provide more "natural" personalised guidance to drivers. This includes looking into getting Alexa to answer questions in a more conversational, contextual manner, for example, if you ask, "Alexa, where do I turn?" whilst driving, Alexa would respond with, "turn directly after the [designated building]." HERE's navigation services are already embedded into more than 100 million vehicles across the world, but it says that Alexa will also be able to help when you're not in your vehicle. HERE will also provide information from its location services platform to the Alexa service, allowing users to search and locate points of interest, access live traffic information, and plan routes in and outside of the car. For example, users can ask Alexa inside their home to remind them to pick up groceries after work, and the service will then identify the optimal route based on real-time traffic information, and provide reminders as the vehicle approaches the store. 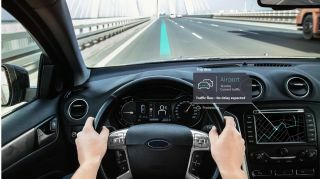 "The in-vehicle user experience is rapidly changing, and automakers today have the opportunity to deliver the next generation of services that maximize the vehicle's utility as the ultimate connected device and providing consumers with the user experience they expect," said Edzard Overbeek, CEO of HERE Technologies. "Our work with Amazon will drive a truly differentiated and delightful user experience, from the home to the car, to where you want to go, and what you need to know."